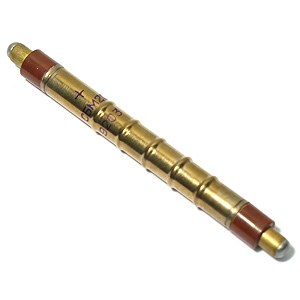 Make your own geiger counter using this very sensitive Russian geiger mueller tube (sensitive to beta and gamma). It is about 97mm long x 10mm diameter. The recommended operating voltage is 350V to 475V. This SBM-20 is one of the most popular Russian tubes in existence and is used in many commercial geiger counters. These are new-old stock and we test every one for 100% operation before shipping. May have slight scratches, tarnish, or cosmetic marks from storage, however these will not affect the performance of the tube. This tube works perfectly with our C8600 Geiger Counter Kit or our C8600ASB Assembled Geiger Counter Kit!